Huron Day, October 6, 2018 was an awesome experience! It is fascinating to share cultural and environmental history with local residents and newcomers. 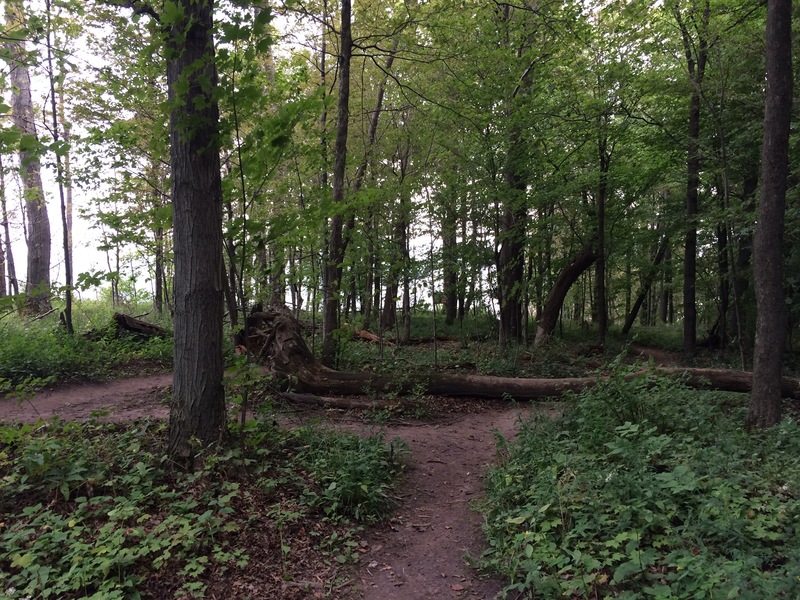 This year’s theme was “Into the Woods.” As I enjoy being in the woods, specifically our local forests on the east side of Sodus Bay and the southern lakeshore of Lake Ontario, this focus was ideal! One of numerous pictures taken in this exact spot, an excellent place to stretch and relax. The bluffs and forest change dramatically through the seasons and years. Witnessing erosion, eagles, Great Blue Herons and wildflowers are among the area’s treasures. 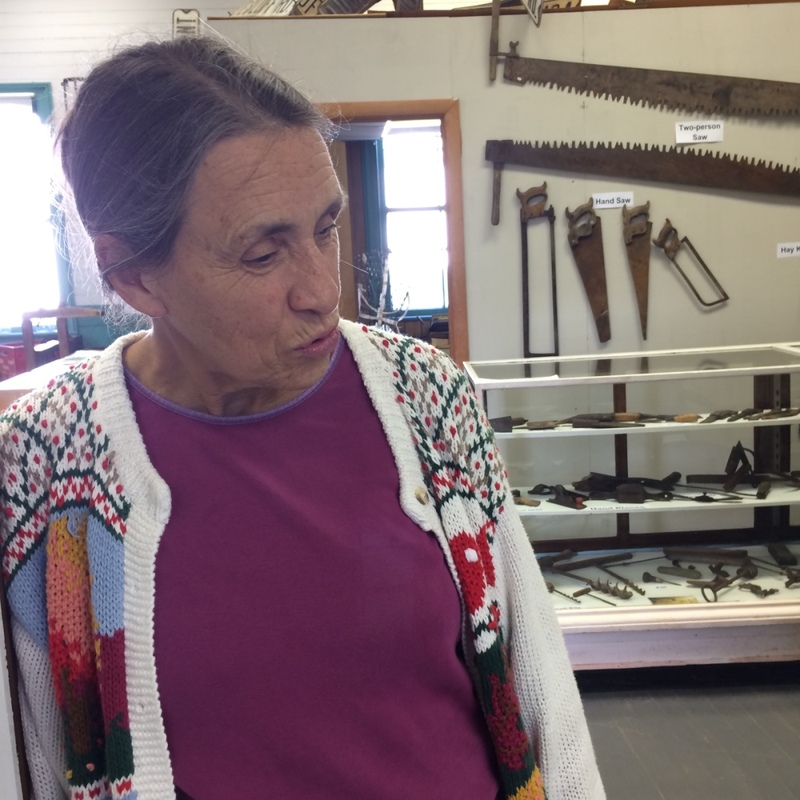 Huron Town Historian, Rosa Fox brought together people who interact with the woods in a variety of aspects, including sustainable forestry, soil and water conservation, mushroom foraging and more. This collection of people and interests represents well the argument presented in Robert Hull’s Infinite Nature: The lens through which we perceive our surroundings and the resulting benefits we calculate can be quite different depending upon our various values and interests. Walking meetings are my favorite, yet today we met inside the historic buildings of Huron. 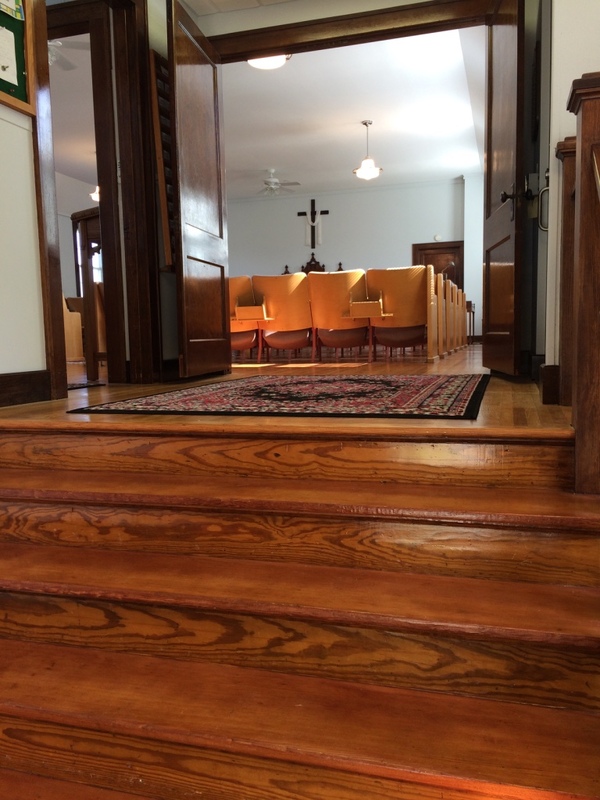 It was my first visit to these buildings and the short flight of wooden steps to the upper room of the Huron Presbyterian Church offered a welcoming invitation. With 20,000 acres under apple production in Wayne County, it earns the title of “Apple Country.” Orchards under spring blossoms and trees heavy with fruit can intoxicate the senses. There are new varieties and styles of production which I was able to discuss with an experienced farmer. Artifacts from the local apple orchards and production drew visitors’ attention. 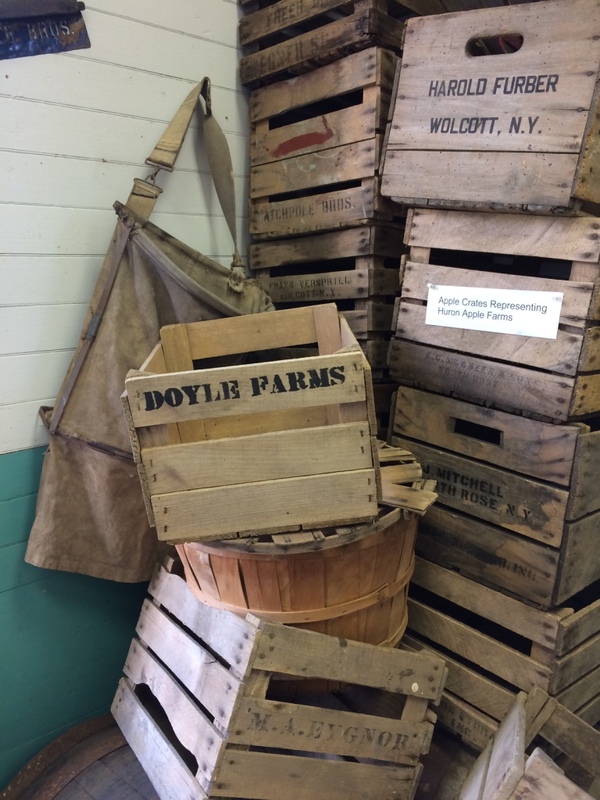 Wooden apple crates, a basket and picking bag at Historic Huron. 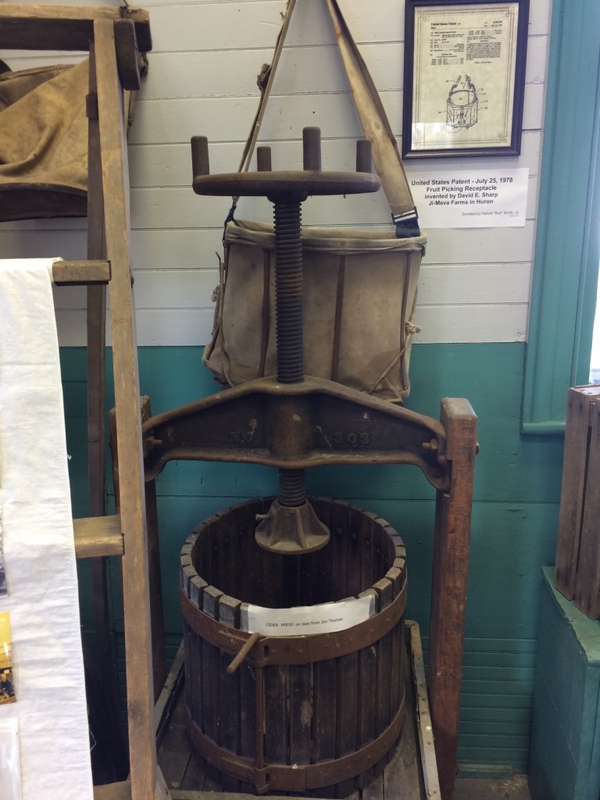 Large piece of impressive cider making equipment at Historic Huron. From local foresters to local public servants, there were so many people to meet and talk with. 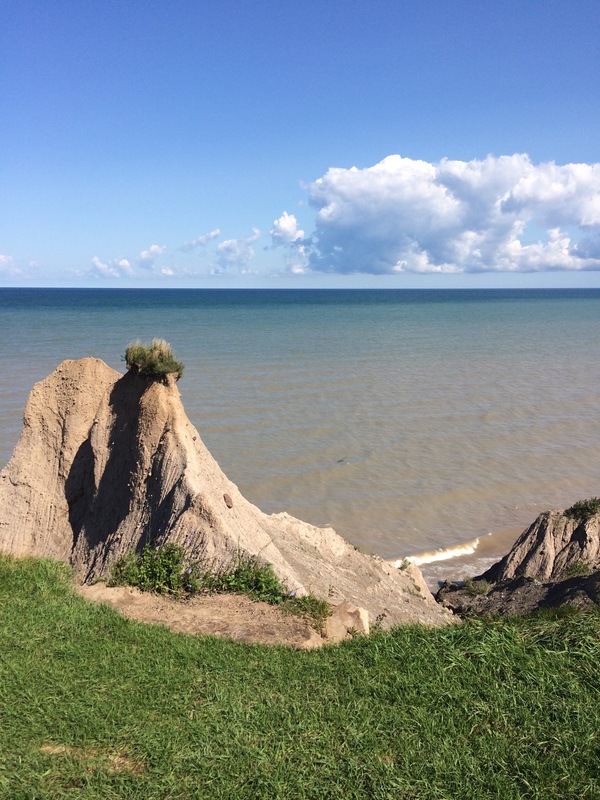 It was a pleasure to share a collection of information from the Sodus Bay Historical Society and Historic Huron which told the history of the lands which are now New York State’s Chimney Bluffs State Park. Asking apple farmers if they drank at the Chimney’s Tavern was entertaining. Watching a young boy’s jaw drop as I explained a connection between lighthouse keepers and local apple growers was too. It was an honor to meet the presenters who came to Huron Day to celebrate “Into the Woods.” I’m thankful to be part of groups connecting people to each other and to the places where we work and play. It is through these connections we gain and share strength. 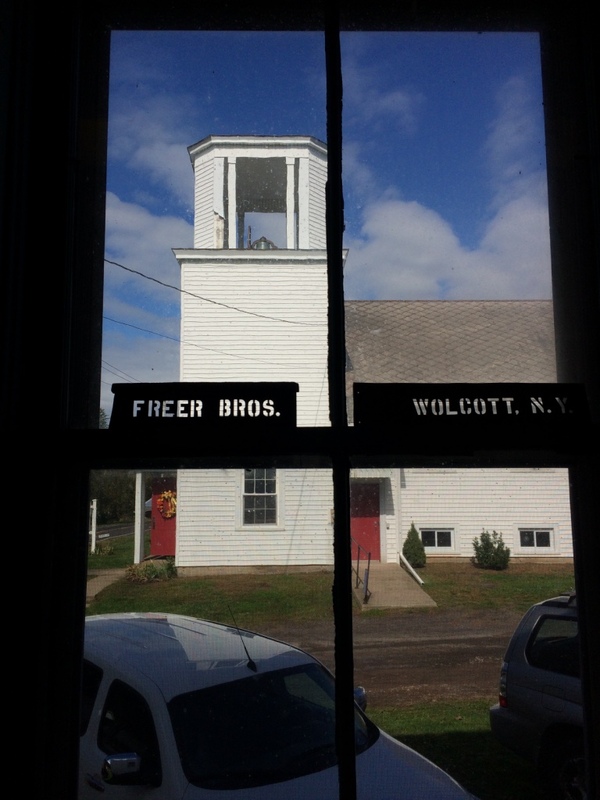 This sign for Freer Brothers Farm celebrates the area’s long history in agriculture, while capturing Huron’s Presbyterian Church and belltower. Rosa Fox speaks with good humor in regards to items within Historic Huron’s collection. Mrs. Fox will be speaking at the Wolcott Library tomorrow at 6:30. 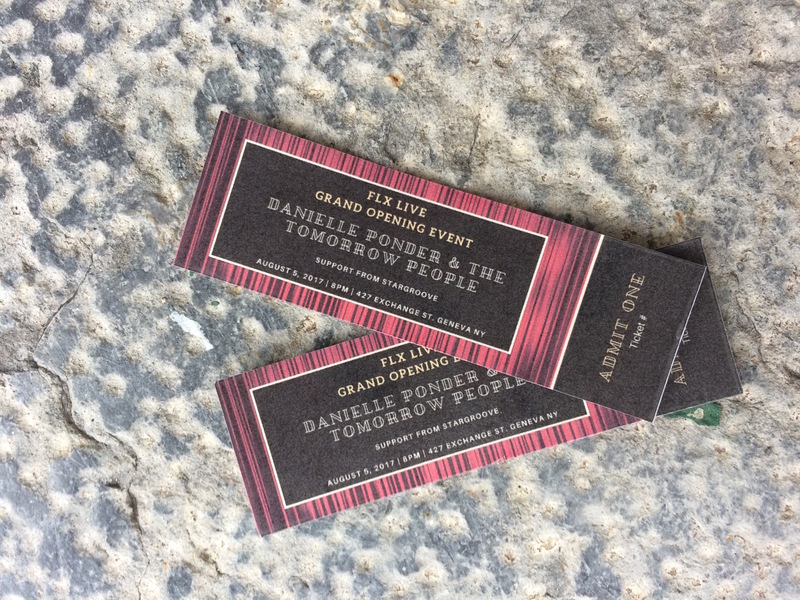 RSVPs are requested. Seize the opportunity to hear what Huron’s historian has gleaned about topics including slavery, sailing and more. If you haven’t seen her book Great Sodus Bay, published by Arcadia Press in 2016, find a copy! This is a must-read for locals and a fascinating book for interested minds. Many of the amazing photos are from the archives of the Sodus Bay Historical Society. Copies are available in the Sodus Bay Lighthouse Museum store and should be in local libraries too! There is still time for cider, cider donuts, apple crisp, hayrides and pumpkins! Our agricultural and environmental abundance is unique-Enjoy! I’m listening, to the wise people around me. Beyond the din, there are those who are committed to others, to working for more than personal gain. Susan Peterson Gateley of Silver Waters Sailing welcomed me and my friends to a water chestnut pull on the Red Creek Marsh Unit in Wayne County many years ago. We met two women, dressed in work clothes whose boats were quickly filling with long, leafy vegetation they were extracting from the marsh. As we began to move the wet, tangled masses to the back of pickups, I reached in quickly and grabbed the plants, only to feel sharp thorns plunge into my hands! Chuckling lightly with amusement and compassion, I was advised not to repeat my behavior and handed a pair of gloves. Novice volunteers worked quickly together to load the invasive plants before heading off for a late afternoon kayak and picnic. The gratitude of the volunteers and kayakers was immense, they were so glad to participate in a positive, healthy activity with other friendly people. Each year the water chestnut returned, but with increased management, including staff from the Finger Lakes Institute, the invasive may be temporarily controlled. If left alone, the plant could cover the waters, blocking out light and making passage for animals and boats impossible. Though quite glad to have this quiet marsh in improved condition, many problems are harder to identify or positively affect. Mrs. Gateley covers many of these pollutants in her movie Lake Ontario: A Quest for Hope. Cayuga Lake has a steward in Hilary Lambert of the Cayuga Lake Watershed Network. Hilary works with residents and municipalities around Cayuga Lake for clean, healthy water. Her team has made great strides with GIS technology, recently releasing satellite imagery of nutrient runoff into the lake. Meet at The Space at GreenStar today in Ithaca to learn more about HABs and other sources of non-point pollution. Dragon boats brought Hilary and I together for the first time. We inspected the lot before they were launched in Cayuga Lake. It only took a few moments to realize she was a savvy advocate for water. Tomorrow, we return to a rest area north of Taughannock Falls to tidy up an area that is a first impression of our area for many. 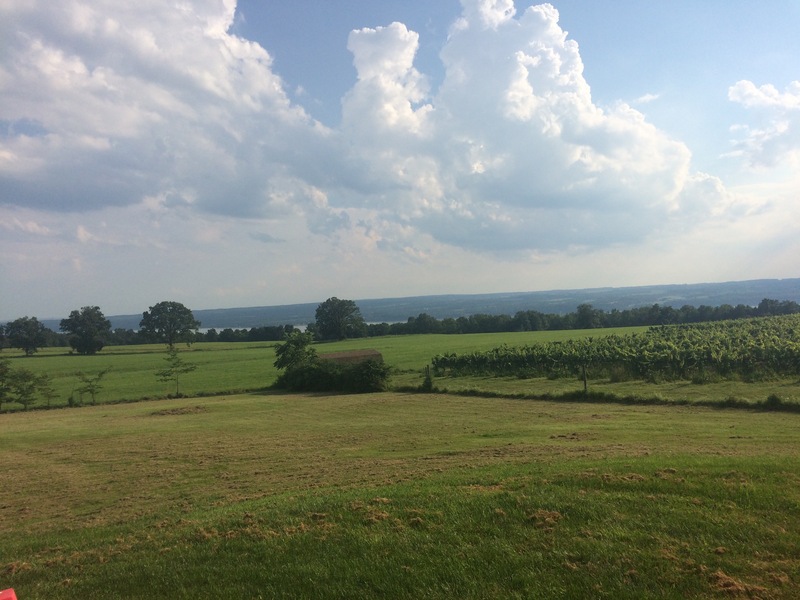 Now under the adoption of the Cayuga Lake Watershed Network, the area lies in an area with a steep incline and stream upon Cayuga Lake’s western shore. This site’s cleanliness has improved! I’m quite surprised to see it in fair condition. Though we are expecting scattered showers, we’ll eliminate any trash and celebrate our progress with a hike at Taughannock Falls and snacks from GreenStar! Another amazing woman has entered my life. She is 103 years old! She is sharp and educated, living a life of civic engagement and within a thriving rural community. Talking with her about her life and reading local works has opened a vivid world of regional understanding and cultural possibilities. She often says she could use another fifty years for everything she would like to do. What will we do and share? More details about this amazing woman and tomorrow’s cleanup! Feelings of adventure include confidence, doubt, curiosity and informed foresight. Driven forward by this momentum, I drove to New Park to see what the fuss was all about. Down the road from Taughanock Falls, this hidden gem of an estate lies behind a long wooden fence. Arriving promptly for my appointment, Director of Operations, Martin Horn welcomed me warmly and began to describe the grounds. My ability to speak left me as I observed the surroundings. Magnificent details shine as part of a whole vision of vitality, excellence and comfort. A custom glass rendition of the Finger Lakes inside a shower, elated me! Vintage telephones, a telephone booth and fluorescent lit jukebox also captured my attention. Three sculptures of Jay Seaman accompany guests in an open outdoor area between buildings. A copper musician plays the trombone in celebration and joy in the garden at New Park. Jay Seaman’s sculpture appears to catch a ribbon unfurling. 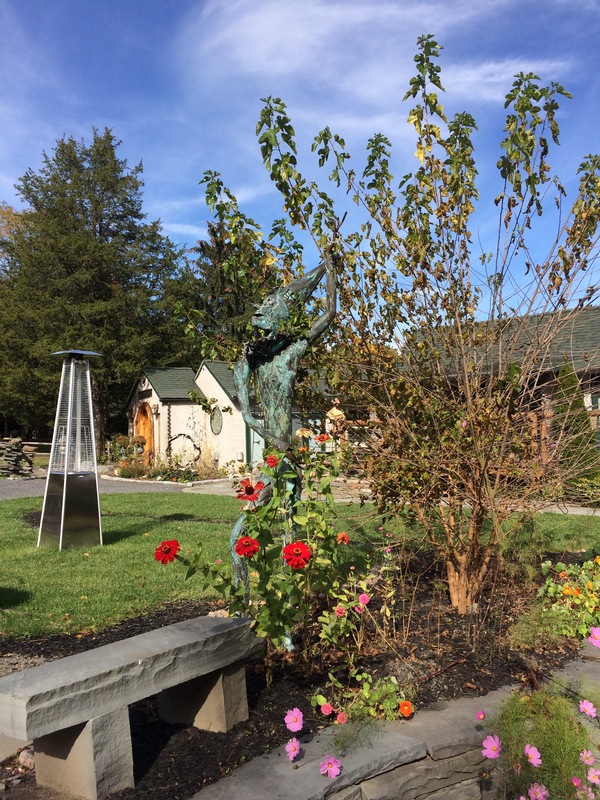 Jay Seaman’s oxidized copper jester sculpture blends into the garden discreetly. 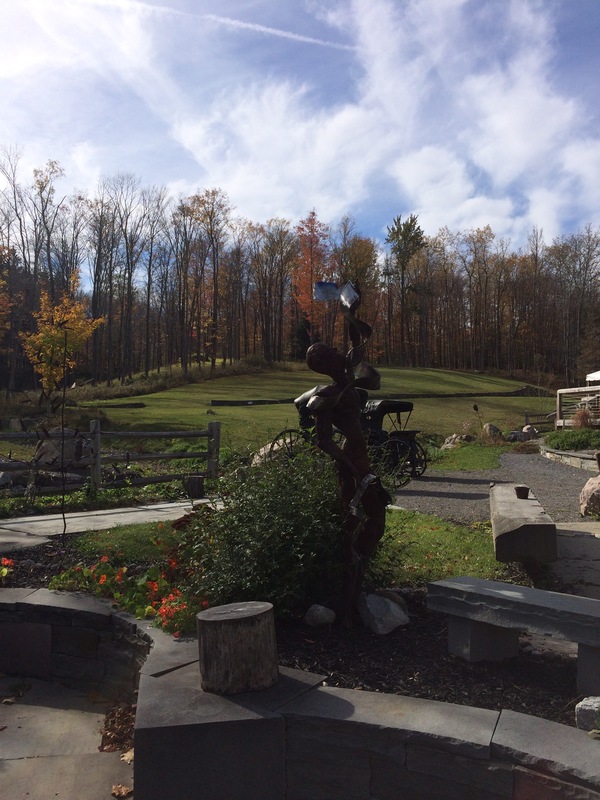 Created by Jamie Kehoe, New Park offers a unique, natural and luxurious venue to enjoy the Finger Lakes in numerous ways. This welcoming space boasts cozy, woodland views while hosting guests gathering for celebrations, workshops and retreats. A spectacular site for a destination wedding, New Park Corporate and Wellness Retreat can also meet needs of individuals and small groups. More than a lodging facility, New Park provides a relaxing space to create memories through active means. Try paddle boarding, indulge in a wine and cheese seminar amidst a woodland walk or learn about birds, water, African dance or butterflies! Sharing magic, through art, hospitality, education and celebration continues to guide activities at New Park. 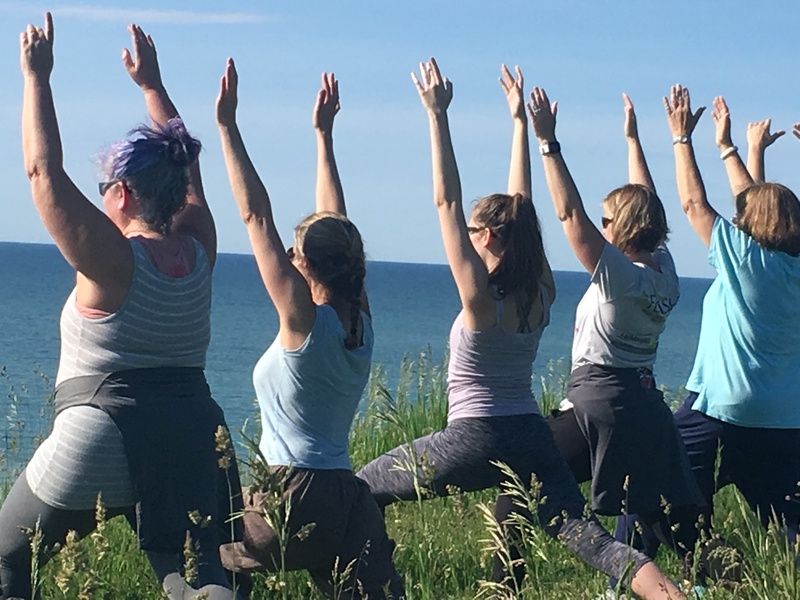 Participants look north over Lake Ontario as they strike a yoga pose on top of MacIntyre Bluffs at Sterling Nature Center in Sterling, NY. Our busy lives can affect our health in many ways. Therefore it is particularly important to develop and maintain a wellness practice that will enhance one’s physical vitality and resilience to stress. 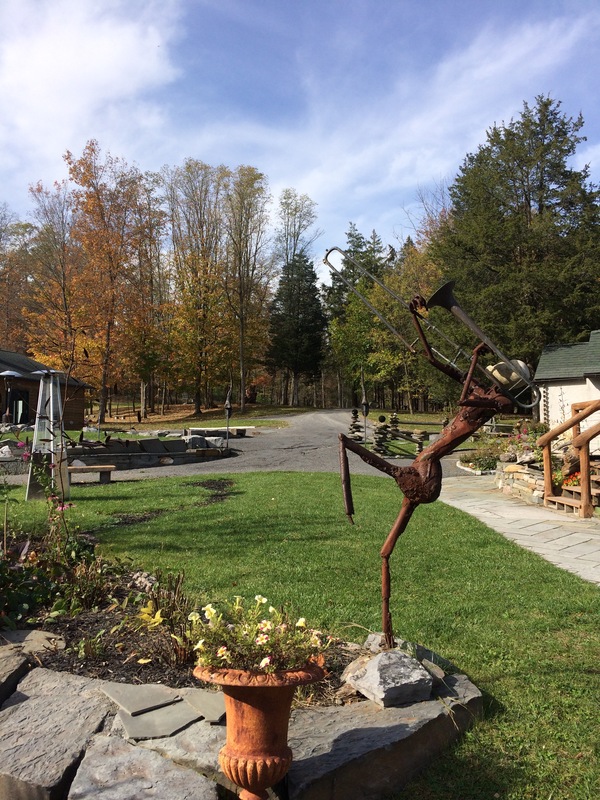 Recently, I was thrilled to team up with Karen Haas and Susan Gately to facilitate a yoga hike at Sterling Nature Center in Sterling, NY. 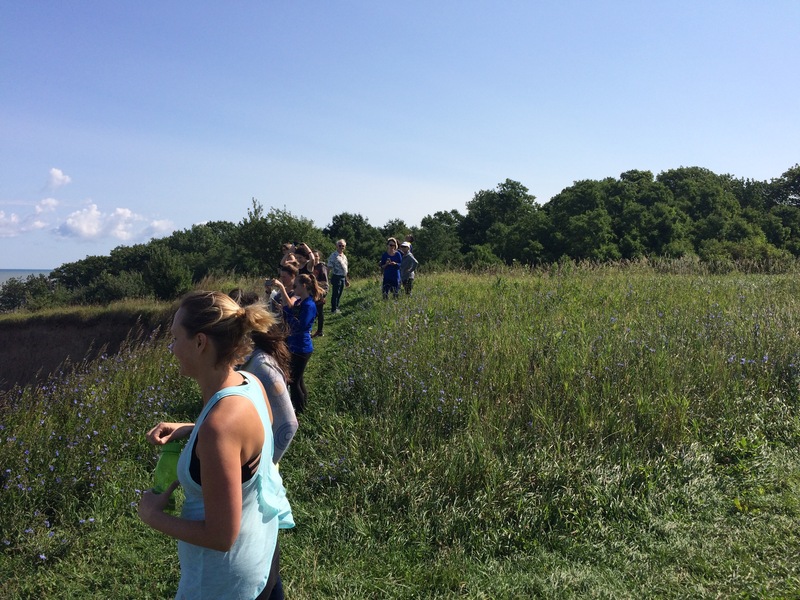 Teachers from Red Creek gathered at the 1,428 acre nature preserve to follow yoga instructor Karen Haas of Bayview Wellness Center in Fair Haven, NY in yoga poses throughout the Cayuga County park. 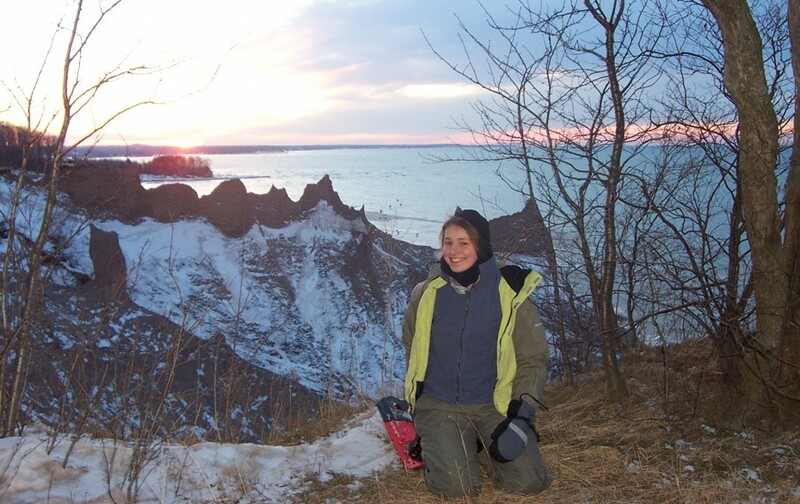 Lake Ontario sailor and scholar, Susan Gately provided insight into glacial geology, erosion of the bluffs and beach, beaver activity, bird identification and more. 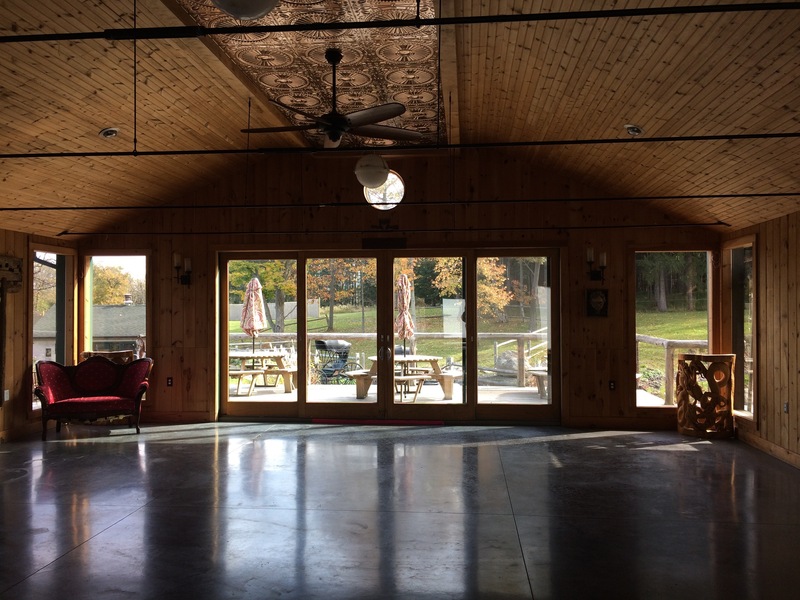 A treasure of a property along the shoreline of the Great Lake between New York and Canada, attendees practiced yoga and hiked in many different settings. A meditative walk through a quiet forest set the tone for yoga beside the lake. 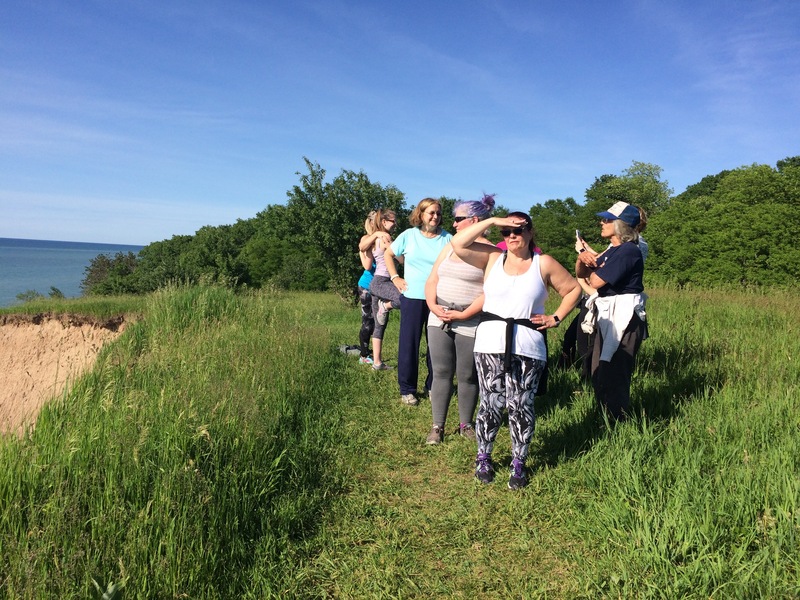 Group poses, chosen to match the location, warmed participants up before a quick walk along the sandy beach and up the steep trail to MacIntyre Bluffs. Practicing poses high up over the lake in perfect June weather was a spectacular experience! We placed our arms upon each other’s shoulders and moved into a group eagle pose, as if we were going to soar to Canada!! Liberation, joy and slight pain were all bursting through this part of our session. Participants took pictures before descending the trail to the beach to observe our surroundings. Evidence of beaver activity drew us away from the pebble beach to look over the tip of a marsh adjoining the lake shore. 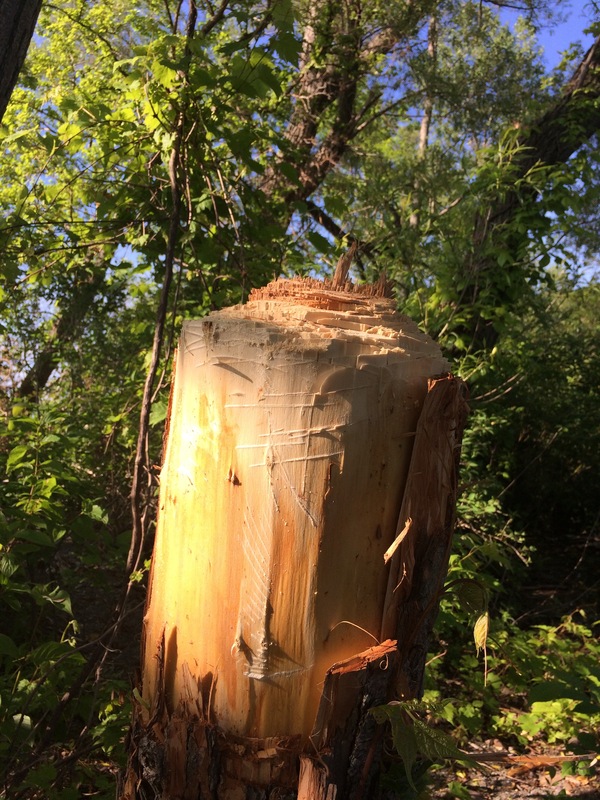 A tree stump and logs shows evidence of the labor of beavers. Exploring and researching new locations and activities is a favorite part of my work. 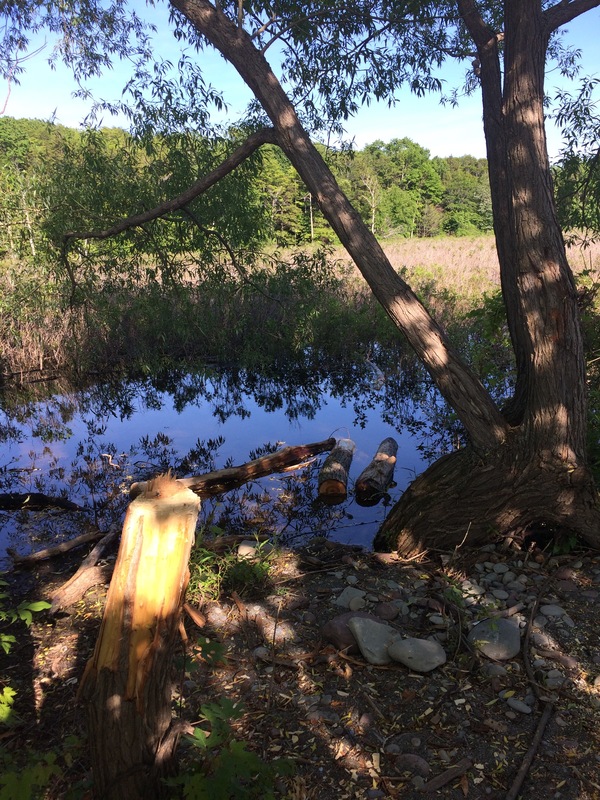 Before developing this walk, I was unacquainted with this nature preserve. Now that I know how to get here and I’m aware of the numerous and diverse trails and waterways, I’ll be sure to return! If you do go to the Sterling Nature Center, don’t rely upon Google Maps. Numerous guidance tools may be wise, including a paper map. Trail maps are likely available onsite at the kiosk beside the parking area and can be viewed here. 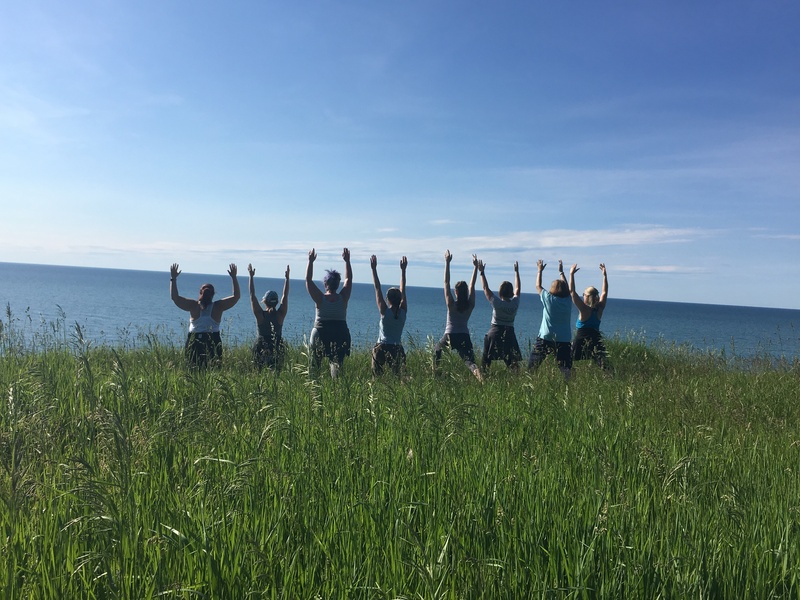 Participants reach to the sky while overlooking Lake Ontario’s blue waters during a recent yoga hike. 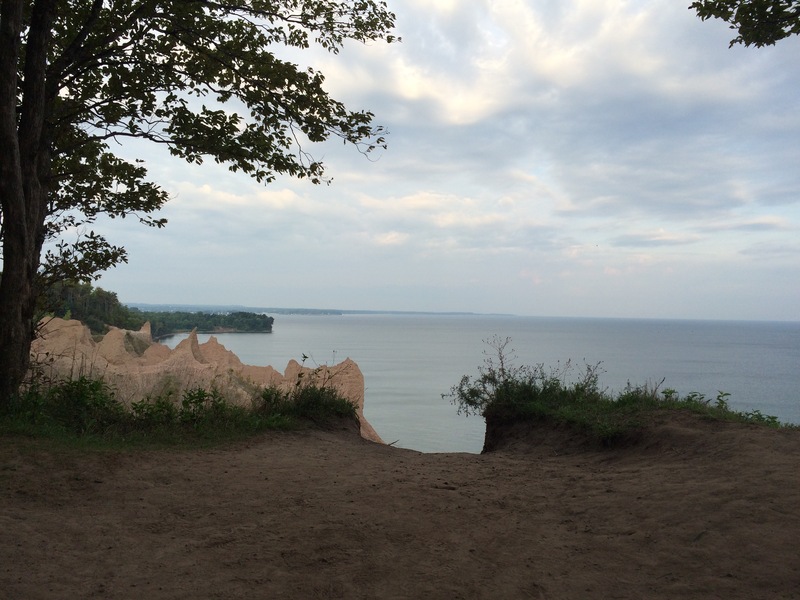 Sun sets on Lake Ontario behind spectacular Chimney Bluffs and the author. Sunshine becomes a rare treasure in upstate New York. Vitamin D, bright colors and imagery can warm one’s view and outlook. Sun graced snow covered fields and wetlands early this week, making a snowshoe at the Montezuma Audubon Center idyllic. Caution was necessary as trails were not easily followed with the fresh snow cover. A rare road trip with friends to attend live music in another city offered greater fuel than one might think! Joyful dancers embody courage and hope of the human spirit. Local DJ, Mike Judah spreads positivity internationally through Reggae Explosions on WICB, Ithaca College’s radio station. He asks listeners to be conscious and loving in their actions, while sharing the affirmative messages of Reggae music each Thursday morning from 10-12 am. My interdisciplinary studies of adventure education and media arts push and pull my social media and outdoor tendencies. After graduation, time near waterfalls were often spent composing tweets. I’ve reduced my social media activities in order to spend time in nature as uninterrupted as possible. At times, I do enjoy taking pictures but oftentimes I will spend my digital connection time outdoors attending to emails. When I’m indoors, I may be devouring images of nature and details of other adventurers, many on Instagram. Mud covered sneakers and boots inspired my name on Instagram and Twitter. Find me @mooredirtyboots. Cold weather has proven to be a great time for planning events, developing partnerships and organizing photos! A new theme for my blog and other digital maintenance will highlight future and re-discovered photos well. This summer’s projects are beginning to take shape, coloring partners’ outlooks vividly with images of people cooperating to improve and share the places where we work and play. There is a great deal of work to do but winter is long. What helps you to thrive during Finger Lakes winters? Or if you are somewhere sunny and warm, feel free to brag nicely in the comments. Meeting other people who care about our time, each other, our planet, our bodies; can embolden. Posture may improve, eyes may brighten, conversation quickens and ideas and plans begin to form. I’ve seen this phenomenon repeatedly this year. Scientists, farmers, writers, painters, students and professors have become inspired through sharing stories of initiatives that foster wellness in those around us and our surroundings. Customizing multi-faceted adventures in the Finger Lakes is my specialty, yet developing events utilizing adventure education, recreation and service-learning projects is becoming another objective. This year, two events focused upon water. On April 2 volunteers cleaned a stream leading to Cayuga Lake as an “Embrace the Lake” coordinated effort with the Cayuga Lake Watershed Network. After hauling trash from the woods and stream, volunteers enjoyed a picnic lunch and cider tasting at Bellwether Cidery. A walk at Taughannock Falls State Park accented the day with slight snowfall as we said our goodbyes. August 20 was focused upon the Great Lakes, the shore of Lake Ontario in Wayne County, NY specifically. Mission eXXpedition spearheaded the largest simultaneous micro plastics testing yet in an international effort with teams on all Great Lakes. 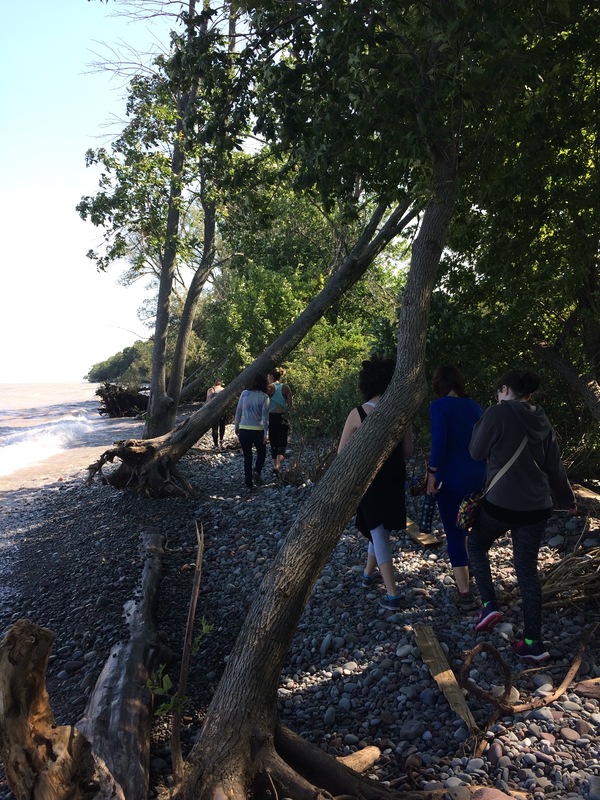 The day began with a kayak tour of Chimney Bluffs, followed by a shore cleanup at an adjacent fishing access area. The day ended at sunset at another beach as we took the final water samples of the day. Results are still being processed yet the teamwork of those involved created a kinship based upon shared values and efforts. Winter is here! At least for a few days. As we pull our snow gear out and look toward holidays and a potentially long winter, know plans will grow like friendships. Emphasis upon a healthy environment, healthy, sustainable agriculture and breath-taking fun can be expected. This blog’s format or theme may change but our mission remains constant, to connect people to the lands where we work and play! For all of the fellowship, hard work and support, I am grateful.